Who knew? I not only mumble but I bumble too!! Just a woman of multi-talents, that's me. To explain....I've been working away on Barn #2 and decided I wasn't happy. Not at all. Quite perturbed actually. It just plain didn't look right. Of course not having taken any lessons in this form of art and having to rely on what tidbits I can glean from books and the internet makes it a lot more difficult. Not having any training in art whatsoever is probably the biggest issue. I'm limited in what I use for fabrics to what I have in my stash so that's part of the problem. Anyway....do you see the grass? Can you see that it's a great big fat mound of yuck? I wanted a field of grass and it looks like there's too much 'distance' to it - for lack of a better explanation. It's too much. To my seriously un-trained eye I think it looks better. It's no longer seeming to be the focal point. Maybe. Or maybe not. or should it be scuttled altogether? - Although I would never create one of THESE, I have to admit it made me smile. - In my quest to learn all I can about landscape quilting, I have found a wonderful blog and am slowly reading my way through every one of her posts. THIS particular one definitely caught my eye and not because it's for landscapes. She has an amazing tip for the sane quilters out there that have issues with deciding on quilt block arrangements and spend tons of time moving blocks about to settle on a layout.. Go see what she does (scroll down a bit in her post to see it). Talk about inspired!! - There's a really pretty crocheted shawl pattern available HERE. Perfect for a wedding shawl I think. And HERE's another wonderful one that would be a perfect stash buster. Be sure to scroll down to see some of the different colourways. - I love THIS one for all the versatile ways you can wear it. Oh, and just for fun, how about a picture of DH's garlic crop? Planted in a container on our balcony! Today the quote is from Warren Buffet...."It is better to be approximately right than precisely wrong"
Yes, I'm definitely mourning the loss of my beloved Janome sewing machine (most of you will remember the tale of woe that led to its demise and the subsequent purchase of a Bernette). After spending a lot of time with the Bernette I have reached the sad conclusion that, in many ways, it is best suited for a boat anchor. The only feature I can honestly say that it has that I truly like is the 'needle down' - the rest of it is cheaply made and it shows. The latest disappointment was finding it is woefully unable to free motion, despite following (explicitly!!) the directions and consulting several on-line tutorials. It simply Will Not Work. It heartily dislikes any 'different' threads (ie. monofiliment) and will snarl at me no end. (And yes, before you ask, I have done a TON of research to see what I could possibly be doing wrong). I have sewn for pretty much all my life and have spent more time in complete and utter frustration over this thing. Unless and until I manage to win a lottery I guess I'm stuck with it, but I'm definitely not happy with it. Bottom line? If you're considering buying a sewing machine anytime in the future and want it to do more than sew in a straight line, don't get a Bernette 20!!!! This isn't the entire scene, but I thought I'd show you the barn at least. The rest of it is still under construction (or destruction, depending on the degree of sewing machine foul ups!). - I may have shared THIS free pattern for a nice bag with you already. Please forgive my 'mental-pause' if I have!! - And a fun bag pattern/tutorial can be found HERE. For some reason I can 'see' the embellishment being a wonderful cluster of lots of buttons. - THIS is a really cute knitted toddler sweater. Today I have two quotes for you. The first one is from anonymous..."I've had full conversations with my sewing machine. They haven't all ended well" (and you can be sure that there have been numerous 'conversations' happening here!). and another one shared by my friend Maureen...and coming from Phyllis Diller...."Maybe it's true that life begins at fifty, but everything else starts to wear out, fall out, or spread out"
Rust dye - a tutorial of sorts! SUPPLIES: - fabric scraps, preferably cotton and preferably washed beforehand to remove any manufacturer's sizing; some steel wool (found at the hardware store) and some vinegar. Some sort of flat container large enough to hold several layers of fabric (I used an aluminum disposable pan that is meant for roasting a turkey - found at the grocery or dollar store). If you happen to have access to some old washers, nails or whatever might rust (raiding your DH's workshop might yield all sorts of goodies) you can add those to the mix. Some salt. PROCESS: I laid down a piece of fabric in the bottom of the pan and then pulled long pieces of steel wool out of the pad and laid them down over the fabric. Repeat the layers as often as you'd like. You can add any other bits of metal to your layering. If you have a spare spray bottle, fill it with vinegar, and moisten each layer well as you make them....if you don't have a spray bottle, just wait until the layers are complete and slosh the vinegar over top until everything is wet. Some people suggest putting the entire thing into a large garbage bag and then tying it shut. I didn't, because I want to watch the process and stop it when I felt happy with what I was seeing. I found that about 8-10 hours was long enough. When you feel it's 'cooked', carefully remove the strands of steel wool and set them aside for a later session.You might want to wear rubber gloves for that because it will stain your fingers somewhat. REMEMBER whatever you set those rusty metals onto will end up being dyed too, so be careful!!! Rinse the fabrics really well until the water runs clear. I then put about 1/4 cup of salt into the sink along with enough water to cover the fabrics, swish around until salt is dissolved, and let sit for a few minutes (5-10 mins is enough). Rinse thoroughly again. Dry your masterpieces, press them and you're all done. - I don't know if any of you are fans of alcohol inks, but if you go HERE there's a good tutorial on how to make your own, for a fraction of the cost. - If you happen to have an odd, unlabeled, ball of yarn (or dozens!) in your stash and you would like to determine the yardage in the ball, there's a good article HERE to explain an easy way to do so. - There's a nice tutorial here for a cute little stash buster that might come in handy for gift giving. - And speaking of stash busting, HERE is a great use for bits of yarn you might have in your stash. It's just one of a ton of free patterns that can be found at THIS link. Today your quote is from an unknown source..."No one can destroy iron, but it's own rust can. Likewise no one can destroy us. But our own mindset can"
All my little experiments are dried and ironed and ready for use. Not quite sure what I will use them for but I'm envisioning (with a little more tweaking) that some might end up being barn roofs. - For those of you who enjoy working with paper, perhaps you'd like to combine it with coffee (go HERE to see what I'm talking about!). - There's a cute little tutorial HERE to make a keepsake bear from a cherished baby outfit. - You can go HERE for part one of a 3-part series on how to begin making landscape quilts. Some great tips! At the bottom of the post you can click for parts 2 and 3. - A few days ago my friend Maureen shared some of her favourite quotes with me. I thought you might enjoy them too, so I will, over the next few posts, share them with you. Thank you Maureen!! The first one is from Lillian Carter (mother of President Jimmy Carter)..."Sometimes, when I look at my children, I say to myself, 'Lillian, you should have remained a virgin"
and this one is from Eleanor Roosevelt...."I had a rose named after me and I was very flattered. But I was not pleased to read the description in the catalogue: No good in a bed, but fine against a wall"
This little fellow winged his way out west to live with our youngest grandbaby and by all reports it seems to have been a big success. So much fun to make, and used up some scrap yarn from my stash. Pattern is 'Donato' and is a free pattern found on Ravelry HERE. (and before you ask, no I didn't do the watercolor that he's posing with! It was painted by my Australian cousin). I can't (won't) show you what I'm doing right at the moment because it's an icky mess. Currently there's little bits of cloth hanging over the chairs on the balcony so they can dry after I've rust dyed them. Not exciting at this stage (come to think of it....maybe not exciting at ANY stage!!). 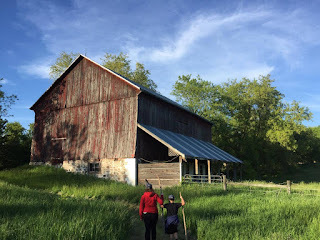 - I've been asked for a review of the online Craftsy class that I took prior to undertaking my barn landscape and I'm more than happy to do so. The class was called "Pictorial Techniques with Machine Applique' by Wendy Butler Berns and you can find it HERE. If you are at all interested in creating landscape quilts using your own photographs, this is an excellent class! Wendy uses a technique that is really easy to master and the amount of detail you choose to include in your project is up to you. Of course you know I can't NOT include at least some embroidery!! - THIS is a really cute pillow. This is another quote from an anonymous source..."We get so worried about being 'pretty'. Let's be pretty kind, pretty funny, pretty smart, pretty strong"
I'm sorry to say that my barn project is finished! Sorry - not because I don't like it, but sorry because it's done and I can't play with it any more. I had SO much fun creating this and I know I am going to be doing more, once I augment my stash enough to do so. You will notice I took a little creative license and left the people out and added a couple of horses to the scene. I'm giving this as a Christmas gift and the people once owned two horses, so I thought it would be nice to include them. The frame was a perfect thrift store find! These are the types of barns I'm fascinated with. 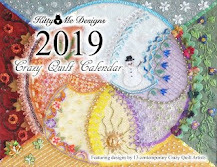 - If you happen to be a long arm quilter, perhaps you'd like to read about how Vicki uses zippers to attach quilts to her machine at her post HERE. - There's a tutorial HERE to make a cute little wallet. - If you happen to like pouches, there's an unusual one HERE. - Pool noodles. 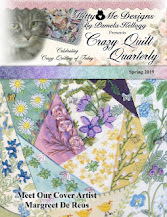 They have great uses in quilting and you can see that HERE. - How about a tool belt for your sewing machine? I don't know about you, but my tools are constantly rolling/falling off my sewing table and one of these would be so handy! Today the quote is from anonymous..."The same boiling water that softens the potato hardens the egg. it's about what you're made of, not the circumstances"
I rather doubt that you can see much difference!! Trust me though, there IS some. The grass area is complete - the horses are re-done (several times over!!) and there are tons (!) of feather stitches and straight stitches on the trees. Maybe if you scroll a couple of posts down you can see the difference from when I started. And you should be able to click to embiggen this picture too. - Suzi of Suziqi Threadworks has announced that there's a sale for her online workshop called 'Peaceful and Pondering' - a class in making her absolutely stunning fabric books. Go see HERE, even if you don't plan on taking the class!! Her work is amazing! - Thanks to Dolores for giving us the head's up about the free patterns to be found HERE. - There's an interesting article HERE about how creativity can affect your well being. - HERE is a great article about how to use tea bags in your art - printing on them with your printer sounds intriguing! - Sandy Babb has a wonderful video HERE about pressing and using botanicals in your art. Today your quote is from Khalil Gibram..."Progress lies not in enhancing what is, but in advancing toward what will be"
I'll start with the 3's aspect of my post today. You know how there's an old adage that things happen in three's? Well, first came the fender-bender with the car.....then my ceiling light/fan in my sewing room decided to start shorting out, which necessitated a call to the building super to come and fix it. He came this afternoon and yes, there was a loose wire inside and he repaired it. Well....I turned it on tonight and, you've guessed it, it's still not working. Argh! The third disaster was yesterday afternoon when we were both sitting relatively still and there was an unexplained crash. Investigation showed nothing....until......DH went into our storage room and realized that a wine bottle had mysteriously turned itself sideways on the shelf and decided to make a run for it. Literally. HOW it got turned is a complete puzzle because nobody was near it....nobody had been near it....or anything else on the shelf. Yesterday was quite warm. We're told that saunas are good for your health, so after we moved everything out of that room and washed everything (including the walls), we know that the sauna-ish health benefits must be SO good! That outta be our three!! In and around all the mopping and cleaning, I did manage to get a little more done on my barn quilt. I don't know if you can tell the difference from this picture though! I have a question for you - if you happen to own any books in your collection that pertain to making landscape quilts, which one(s) would you recommend? And why? It's something I would like to do more of, but I need some instruction that might help me figure it out. Thank you in advance!! - I love this style of quilting and the subject matter too. And THIS one too. And THIS. Today the quote is from an unknown source... "Don't worry about what people say behind your back. They are the people who are finding faults in your life instead of fixing their own"
Remains to be seen how much of a mess I'm going to create from now on in! Stupidity runs rampant here at Chez Magpie - at times the degree of same increases beyond even my expectations. Our much-loved Toyota Rav4, with me at the helm, managed to back into a little Pontiac Sunfire whilst attempting to exit a parking spot. Sunfire got the worst of it and I feel exceedingly stoooopid. Nobody was hurt, fortunately, but it's taking awhile to recover from the self-abuse I'm wallowing in. First time in all my years of driving that I've done something that dumb and I must say that I hope it's the last! I'd like to also wish our neighbours to the south a very happy 4th of July! Be safe. - There's a really pretty quilt pattern available through a link HERE. I love the colours the artist used. - THIS artist does really great work (there are three different links to see her work, so be sure to click on them to explore!). - There's a really pretty crocheted trim pattern & video found HERE. - Some beautiful art quilts HERE. Today your quote is from an anonymous source..."You can't fix stupidity - even with duct tape"